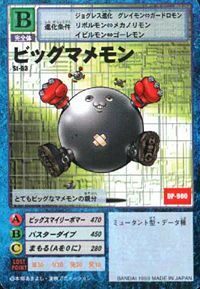 A Mutant Digimon which exists as the boss of Mamemon, which hold the alias of "Smiley Bomber". As a matter of fact, it's suggested that it is an aggregation of Mamemon. 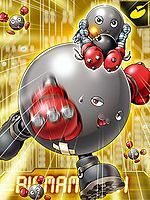 Since normal Mamemon are the same size as Child Digimon, they possess a degree of power that couldn't even be imagined from their appearance, but as its name suggests, Big Mamemon is dozens or even hundreds of times the size of a Mamemon. However, the reason why a "Mamemon" is this size is still unclear. Its personality is extremely gentle, and it hates conflict and battle. It is always playing with its Mamemon followers. 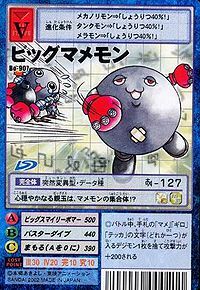 Its Special Move is using its Mamemon followers themselves as weapons (Big Smiley Bomber). It's rumored that after using this technique, its size gets smaller. A Mutant type Digimon who is tens of times bigger than a normal Mamemon. Its Special Move is Big Smiley Bomber. Anime/Manga Digimon Adventure 02: "Coral and Versailles, The Rebel Fight!" 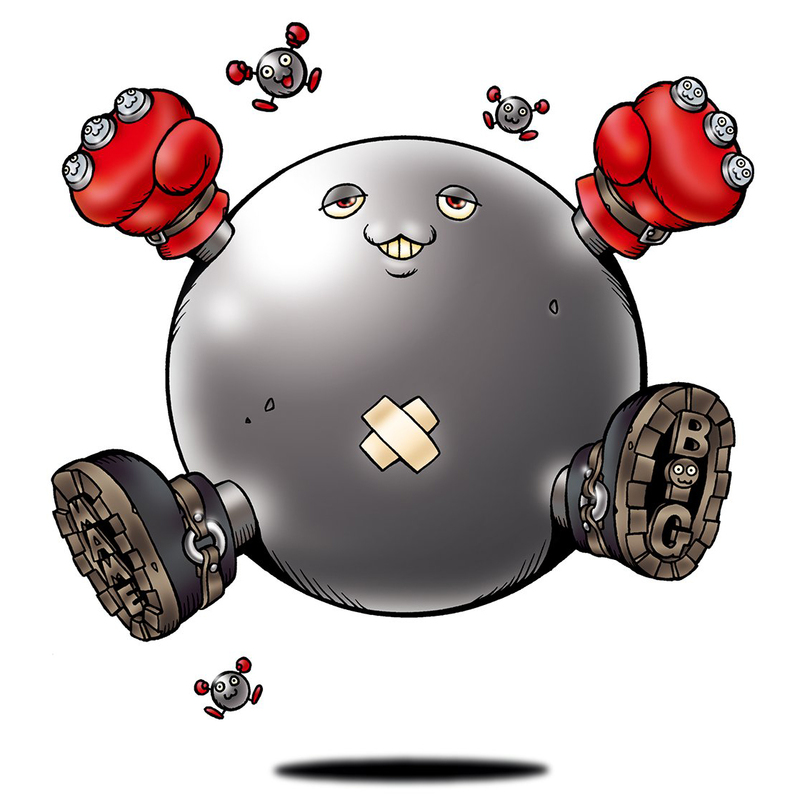 Big Smiley Bomber  ビッグスマイリーボマー Biggu Sumairī Bomā Big Smirk Bomb/Big Smiley Bomb Creates a bomb from its fist and throws it, or uses one of its Mamemon followers as a weapon. Buster Dive  バスターダイブ Basutā Daibu Buster Dive/Heavy Dive Dives down from the sky to crush the enemy. Big Mamemon was one of the three Mamemon brothers (along with Mamemon and Metal Mamemon) who were randomly transported to Paris by Oikawa's Digi-gates. They occupied the Palace of Versailles and began consuming large quantities of wine (fruit juice in the English dub). After Giromon captured Catherine and her Floramon he brought them to the Mamemon brothers to hold her there. Taichi, Agumon, Takeru, and Patamon arrived. After some initial pie throwing Agumon and Patamon evolved to Greymon and Angemon. The Mamemon brothers "took the fight outside" by smashing through the wall of the palace with Greymon and Angemon in hot pursuit. A battle ensnared, in which Big Mamemon attacked Greymon by punching him in the face a few times but Greymon picked up Big Mamemon and threw him. He then fired a Mega Flame which sent him into a pool. Giromon showed up to aid the Mamemon brothers and they started to get the upper hand. 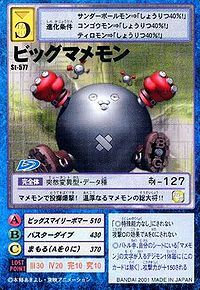 After Giromon softened Greymon and Angemon up, Big Mamemon resurfaced and got in a hit on them both with his Big Smiley Bomb. But then Taichi, Takeru and Catherine evolved Greymon, Angemon and Floramon to Metal Greymon, Holy Angemon, and Kiwimon. 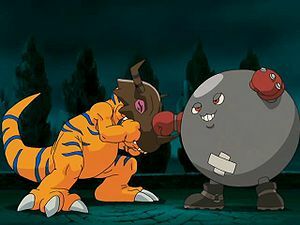 Big Mamemon hit Metal Greymon with his Big Smiley Bomb but it had no effect and Metal Greymon struck him back with Booster Claw knocking him away. The Mamemon brothers (and Giromon) retreat but are herded by Metal Greymon and Holy Angemon to where the Dark Tower in France was. Once they reached it Metal Greymon knocked them out with his Giga Destroyer attacked and they were returned to the Digital World. A Big Mamemon is one of the Digimon hunted by Tobari Ren. Evolves from Icemon, Guardromon, Clockmon or Thunderballmon. Can evolve to Prince Mamemon. 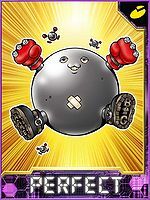 Big Mamemon is only obtainable as a collectible card. Its card is part of the Mame Guys (マメなやつら Mamena Yatsura) set. Big Mamemon is available as a Digimon Medal. Obtained by Jogressing Greymon, Revolmon, Tankmon, Clockmon, Guardromon or Mechanorimon with a compatible Digimon. Can Jogress to Metal Garurumon with a compatible Digimon. Obtained by Jogressing Greymon, Revolmon, Thunderballmon, Clockmon, Guardromon or Mechanorimon with a compatible Digimon. Can Jogress to Metal Garurumon with a compatible Digimon. A very big Mamemon leader. It throws Mamemon to carry out bomb attacks! The gentle commander of the Mamemon!! This gentle-hearted big boss is a polymer of Mamemon!? 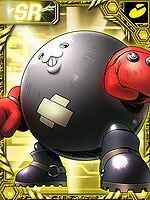 ↑ Big Mamemon was adopted from a winning Digimon entry in the First Original Digimon Contest (Digimon Web). This page was last modified on 21 March 2019, at 17:30.